Drawing by Andrew Wolkoff (2010). 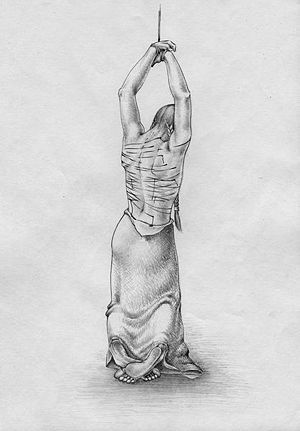 Andrew Wolkoff is a Russian artist who creates drawings depicting the corporal punishment of women and girls (M/F, F/F, /F, M/f). Andrew Wolkoff was born and lives in Moscow. He showed an interest in the graphic arts from childhood, as well as a passion for corporal punishment. His profession in design allowed him to draw inanimate objects with confidence, but anatomy was his weak point. Therefore, from 2008 to 2012, he concentrated on figure drawing and greatly developed his technique. His favorite technique is lead pencil. Usually Andrew Wolkoff sketches a contour with 2B pencil and tones with H-3H. Then he scans it and post-processes the artwork in Photoshop. His ordinary post-process is sharpening and brightness adjustment, and sometimes color toning or painting. All his colored pictures are painted using Photoshop and a graphics tablet. Andrew Wolkoff's favorite theme is historical punishments. His richest source of inspiration is the serfdom in Russia (1500-1861). Those times gave unlimited rights for a landowner over his slaves, which provides unlimited room for the artist to explore scenarios. In addition, these scenes may have a national color. Other topics include inquisition lashing, prison punishments, and traditional domestic spanking. The following is a selection of Andrew Wolkoff's works. Woman Lashing at Inqiusition Interrogation (2010). Slave Woman Waiting for Punishment (2010). Woman Waiting for First Beat (2011). Master and Groom Punishing a Serf Woman (2011). Country Girl Punishment at the Field (2011). Serf Woman Before Lashing (2012). Russian Serf Woman Waiting for Lashing (2012). Girl Waiting for Punishment (2012). Husband Punishing His Own Wife for the First Time (2012). Serf Woman Before Caning (2013). Stepdaughter punishment for a broken jug (2014). Schoolgirl Ready To Punishment (2014). The Girl Who Gets 'F' (2015). La Prima Sculacciate/The First Spanking (2016).